If you are looking for an affordable pallet option, recycled pallets are the way to go. We carry a full line of recycled pallets in a variety of designs. We take the time to ensure that all of your needs are met from the first day you work with us. We will always keep to our promises, and customer satisfaction is our top priority. Find out how we can be of service to you when you contact us today! 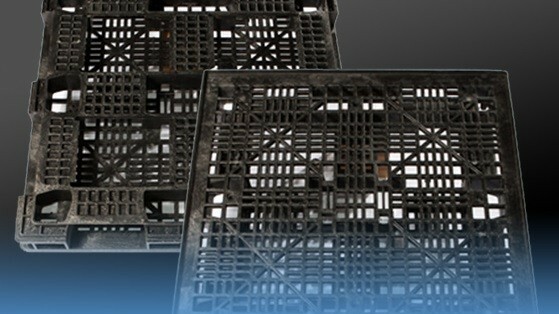 If you're looking for the best way to package an industrial part, Robinson Industries’ recycled pallets may be the answer. Tough, long-lasting pallets can provide maximum safety for your product during transport and storage while it eliminates hidden costs such as pre-assembly and waste disposal. We can custom design pallets to make them easier to move, store, identify and access. Rehrig Pacific has been helping customers find better ways to transport and store their products for more than 95 years. Since our beginnings, we have grown to become a world leading plastic pallet manufacturer and container manufacturer serving the agriculture, bakery, beverage, dairy and materials handling industries. Call us today for all of your recycled pallet needs. Recycled pallets are plastic pallets that have reached the end of their usable life and have been recycled. Plastic pallets can be reprocessed into new plastic pallets, or their plastic can be reprocessed into a completely new plastic product. Since most plastics are made from high-density polyethylene, or HDPE, they can be broken down and reprocessed into almost any HDPE-based plastic product. Plastic pallets boast many advantages over wood pallets: they are stronger and more durable, they can be engineered to be corrosion resistant, they are generally resistant to inhospitable weather conditions and they pose a substantially decreased risk of fire compared to wooden pallets. Their shelf life can also be up to five or six times as long as that of wooden pallets, which usually don’t survive more than two years of use. When a plastic pallet does reach the end of its usable life, it needs to be cleaned and processed. Plastic shredding companies can reduce the used pallet to a manageable size, and further size reduction and texture regulation is usually necessary to prepare any recycled plastic for reprocessing. Once reprocessed, though, newly recycled plastic pallets feature all of the same qualities of durability and strength as brand new plastic pallets. When a plastic pallet is sent to a recycling center, it likely to be cleaned, if necessary, and then processed through an industrial plastic shredder. Once shredded, a combination of granulators, grinders and other processing equipment are often necessary to make the plastic material ready for reprocessing. Once all of those steps are complete, if the plastic material is to be used for construction of a new pallet, the material can be taken to an injection molder. Injection molding is the process by which most plastic pallets are made. The process begins with loading the plastic material into a conveyance channel where a long screw heats and pressurizes it. Once the plastic material has become molten, it is injected into a mold shaped like the intended pallet product. The molten plastic forms to the contours of the mold and begins to resemble its final configuration. Once it has taken shape, it is allowed to cool and harden. Any additional necessary process like deflashing and branding are then applied, after which the new recycled plastic pallet is ready for shipping to customers. There are a few other methods by which plastic pallets are produced, but injection molding generally produces pallets of the strongest and sturdiest quality.